The Bug, as we call the Laser Mouse, meets up for the first time with Iris and Hydrangea's kittens. Hydrangea's kittens will be 9 weeks old in one day and Iris's kittens are 11 1/2 weeks old. I think the Bug was a big success. They were only introduced to The Bug about 30 seconds before we started the video. 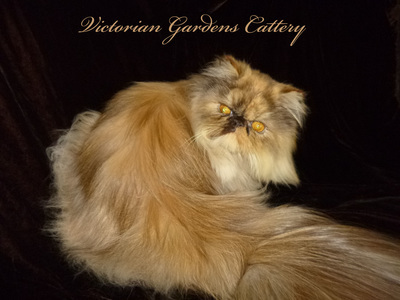 On May 27, 2017, Dave Russo and his wife, Lila Forro, came to the Cattery for a visit to Archie and spend the day with all the kittens and cats of Victorian Gardens Cattery. Dave also brought his camera. We are delighted to share with you, Dave's photography from that special visit. You can view the full Photo Shoot by clicking here. Enjoy. 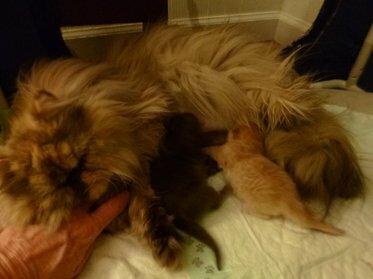 Iris's kittens are doing great. They got some new larger playstations in the last few days and they are having a ball on them. I think I waited to long to do this photo shoot since they kept jumping out of the Chamber Pot, plus the camera did not want to focus well on moving kittens. Enjoy. 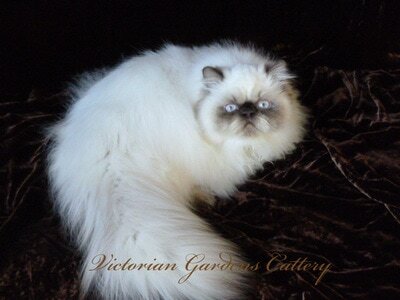 We have just published a video on our YouTube Channel under Victorian Gardens Cattery. Thevideo is of Iris and Hydrangea's combined Nurseries. 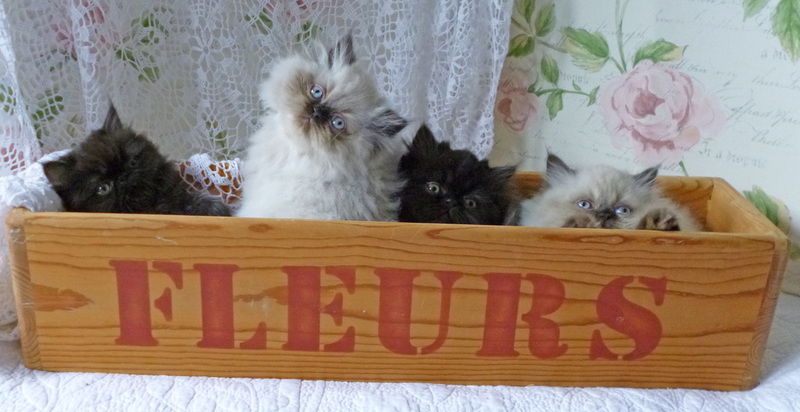 Iris's kittens will be 5 weeks old this coming week. Take a look at how they are doing in our Nursery. Iris's babies will be 5 weeks old this coming week. They are doing great. They are already potty training. We have been weaning them. We will be moving them down to the Toddler Room this coming week so that they have more space to run around and play. They were introduced to some smaller playstations this week. Iris's Red Chocolate who only has one eye is an absolute doll and doing great. He is learning to compensate for only one eye. He runs around like a little crazy man. The babies did great during their bath and photo shoot. Iris's babies are doing great. They are both way ahead of schedule. They are huge. Their eyes started to open the first week and by the end of the first week, they were up on two paws looking around. By week two, they had started walking. They are over 100 grams larger than Iris's babies last year. The Red Chocolate is a special needs baby. I am so glad he has the red gene in him because that makes him a fighter. I suspected he only had one eye when he was born but that was not confirmed until his eye opened and the other one did not. My Vet said not to put him to sleep because he deserved a good life and home and someone would want him. I agreed. He is learning to compensate for having only one eye. He is an ambitious baby and will not let that flaw keep him from his purpose. Both babies are very sweet. They are now out of the nursing cage and into their nursing bed. I expect they will be getting out of the bed soon to start walking and exploring. They really are way ahead of the curve. That also means I will probably start the weaning process within the week. Iris and Miracle welcomed in to this world two male baby boys, via C-Section on Wednesday. 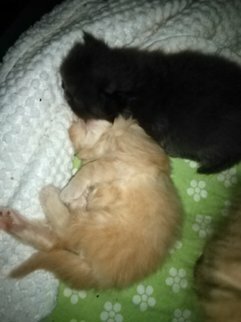 The two babies are nice and fat and doing great. They had a rare Red Chocolate Persian and a Doll Face Chocolate Persian. This litter, depending on when it is born, should be able to leave for their new homes around June 21, 2017.